Working with data, the political introduces itself largely in reporting. The planning, structuring and collection of data all involve organizational power structures, but in an intelligent system all are dependent on operations and/or the current, or envisioned, demand for reporting. I usually find reporting to be the least enjoyable aspect of working with data. Querying data can be very informative, and much of my writing takes one aspect of a data set and explores it with words. Reports are often designed for other people, to their design - particularly executive reporting, which is designed for a quick hit on the status presented in a format the executive are comfortable with. The IESO eventually posted a report for June, weeks later than usual. That is interesting in itself, as it implies the report is designed for an audience the doesn't need it any particular time. I can't think of a benefit of variable intermittent reporting (VIR) in Ontario's electricity sector - must be part of a bigger trend to variable intermittent stuff. This is not the format of reporting on generation I would expect the people reading through a summary report to find relevant. The IESO's long-standing Figure 18, "Monthly Energy by Fuel Type," is a graph of monthly production in the same stacked chart format, but for coherent categories; nuclear, hydro, gas/oil, solar, wind, biofuel and imports. I would think normal people looking at a monthly report might like cost information for the same categories they receive production information. This chart is based on a summary of my estimates using the same data set behind sections of a report I produce each month. This particular view of data isn't one I find as useful as charting the 12-month running total cost. I have little interest in charting the one portion of the cost that is the global adjustment. So I wouldn't choose the IESO's new graphic. 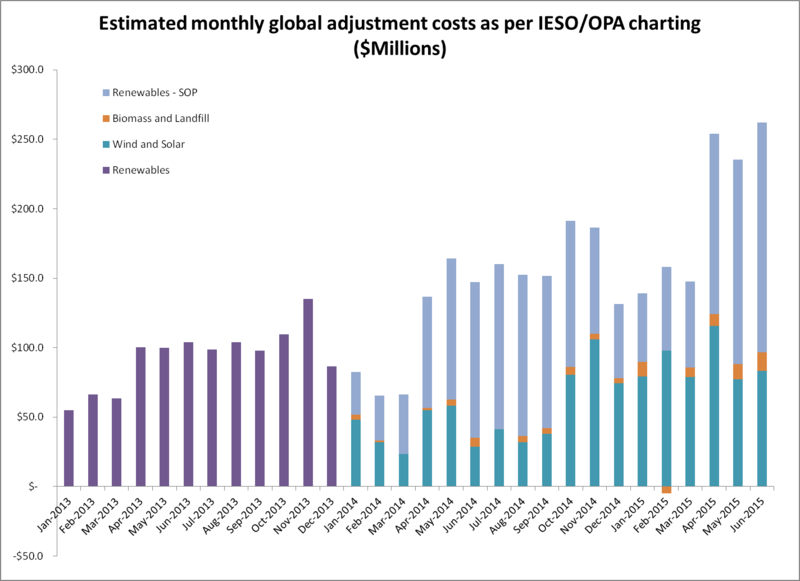 the change in categories between 2013's OPA graphic and the IESO's new one. Graphs are an interesting reporting tool because they hide the numeric data - to most. I am capable of dropping a raster image into a CAD program, scaling it to the axis and taking measurements, so I did. This is not a precise tool but it's useful when no other data source is available. As the process is prone to transposition error I ran some checks on my work. My transposed numbers were furthest from reported Global Adjustment totals in February 2015 (estimated $402 million, $458.7 reported) and March 2015 (estimated $750 million, $706.8 reported). A quick visual check of the IESO's Fig. 23 indicated the issue was not my transposition, but their chart totals not matching their data reporting. The spending fluctuates from month to month, but the trend does not appear to be up. 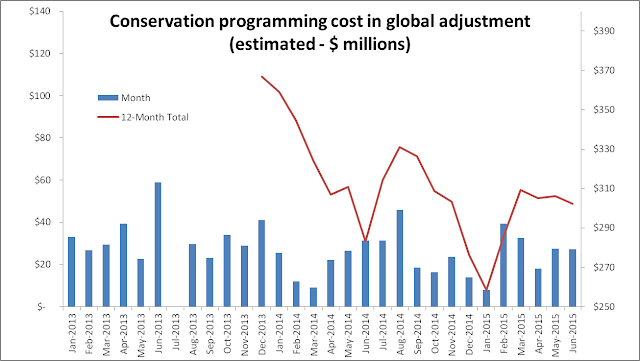 I am pleased as I have never changed coding my estimate based on $320 million per year - which was the average spend in 2010/11. 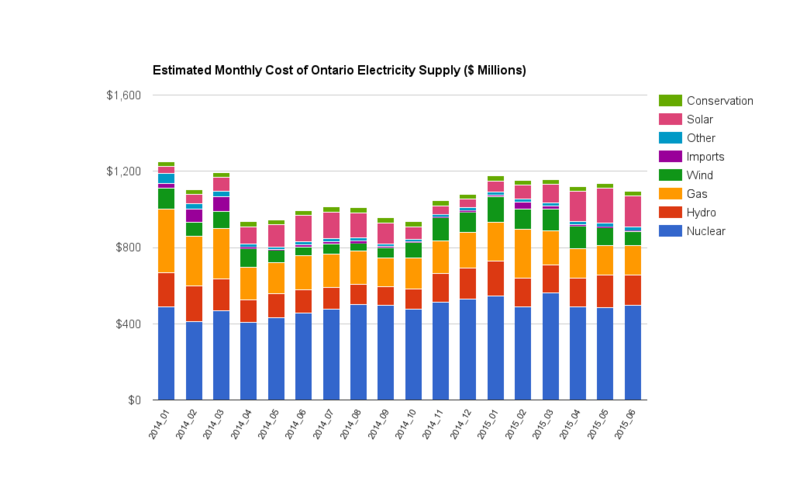 Planned spending was much higher, but I didn't change my estimates because I didn't think anybody would be so stupid as to ramp up this spending during Ontario's current supply/demand imbalance. 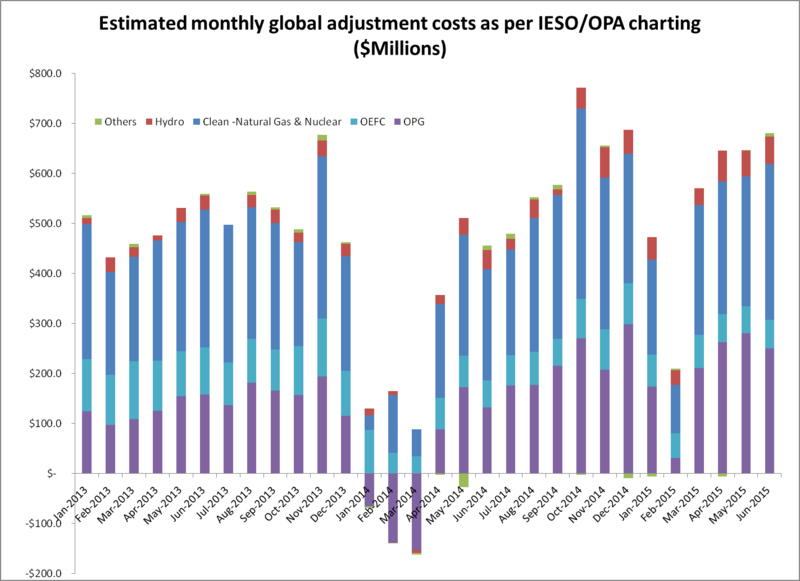 Both the 2013 OPA chart and the newer IESO one include 2 of the 3 categories of global adjustment costs as they are usually shown: the Ontario Power Generation (OPG) bundle and the OEFC-NUG bundle. Also categorized the same are "hydro" and "Natural Gas and Nuclear"; here I've grouped very minor IESO categories of "Financing Charges and Funds" and "Industrial Electricity Incentive Program" in with the old OPA "Others" category. The "Renewables" category from the 2013 OPA Figure 3 seems to have been broken out into multiple categories. I think they might be hiding something. 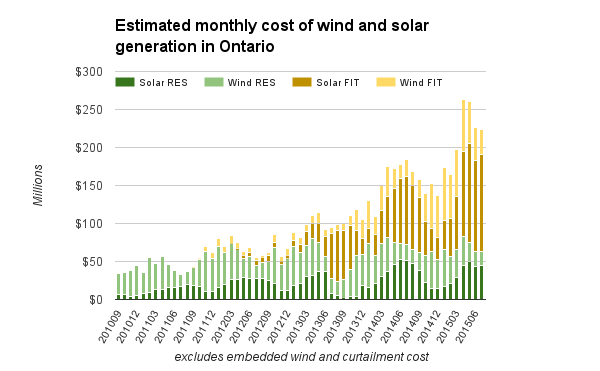 Somewhat worse than the splitting up of old "SOP" (standard offer program ) from "Wind and Solar" is that chances are slim to none that the breakout charted by the IESO resembles reality. 1845 MW of industrial wind now in service was contracted post SOP, slightly more than half of the 3639.5 MW reported as in commercial operation at the end of March. Without estimating it's clear the FIT program, including the related Samsung deal, would now cost more every month than the older Stand Offer Programs. My analysis of Figure 23 leaves me still wondering who desired a graphic in the monthly report indicating one aspect of costs in this deceptive way, but now I'm also wondering if they wanted it right. Graphics, and data, for this post were created either in this Excel spreadsheet, or this Google sheet.